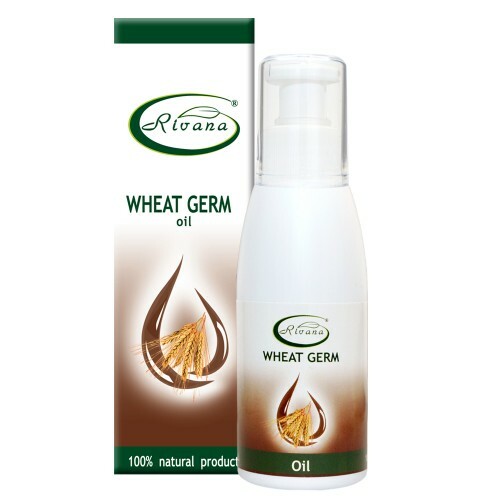 Wheat germ oil-100% natural product without preservatives. Home » Search » Wheat germ oil-100% natural product without preservatives. Produced from cold pressed wheat germ, without further refining. It appears to be one of the most nourishing oils and has best effect on dry and aging skin. Contains vitamin E, lecithin, mineral micronutrients, that protect cells from toxic free radicals, prevents aging, increases the elasticity, flexibility and freshness of the skin. Wheat germ oil is suitable for nourishing the skin around the eye contour, helps with sore spots, scars, lacerations, chapped lips, it is also used against the formation of stretch marks and sagging skin / from the abrupt change in weight or pregnancy /. The oil nourishes and strengthens the hair by giving it brilliance and vitality. The wheat germ oil is used as a preservative. Massage: face, neck, neckline and other parts of the body: put some wheat germ oil on your fingers and massage with smooth moves on clean and dry skin. Lip Care: use wheat germ oil or a mixture of wheat germ oil and another basic oil / jojoba, avocado / – makes the skin of your lips fresh, supple, and restores its natural colour. Apply with gentle massage movements. Hair roots massage – Apply the oil to clean hair and massage into the roots or the hair itself if it is damaged. Leave the oil for at least 20-30 minutes, then wash with a shampoo. Contraindicated for people with individual intolerance to wheat germ oil. Storage: Keep in a cool and dark place at 7-25C. At very low temperatures the oil gets darker and thicker, but when heated the oil returns back to its normal condition. Hello ! I bought this yesterday, and I'm wondering if its safe to eat this whear grem oil too ? I heard that this would be healthy to take 1 tablespoon per day ?